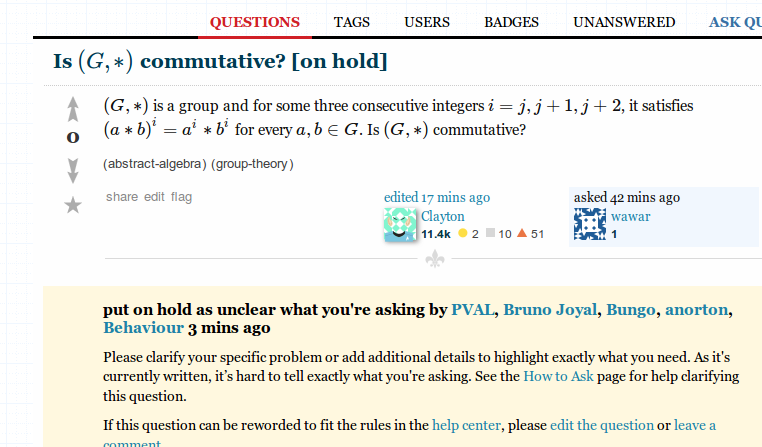 I flagged https://math.stackexchange.com/questions/1074123/is-g-commutative for being off topic but the flag was declined. However, the post was closed for the exact same reason I flagged it. Why would the flag be declined then? I did read Disputed flags (despite closing question) and flags that are not counted. so I understand why a low quality flag would be declined since it goes to the user queue. Does this flag go to some queue as well? When you flagged the question for closure it was placed in the close votes queue. Here it received three reviews, and each of these users opted to leave the question open. It is because of this that your flag was marked as declined. As for the eventual closure of the question, three of the close votes happened before your flag, and two after the review had concluded. Not the answer you're looking for? Browse other questions tagged support flagging specific-flag .